Thousands of Bulgarians celebrated Easter in Istanbul, Turkey, Saturday into Sunday with the mass traditionally held at the St. Stefan church. The service at the church near the Golden Horn, known also as the Iron Church, began at 11 pm Saturday and was delivered by Bishop Teodosiy, who arrived, with three other clergy, from Bulgaria. 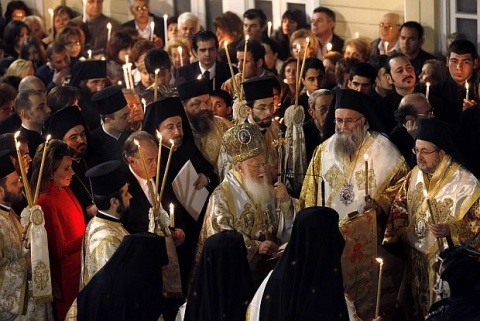 Many worshipers also traveled from Bulgaria to Istanbul to attend the Easter Mass there. The building and the yard were filled with people. At midnight sharp the church bell announced the resurrection of Christ while Teodosiy blessed the attendees. People greeted each other with the traditional "Christ Is Risen," and went around the church three times in observance of the Easter ritual. They also exchanged colored eggs and the Easter bread called kozunak.